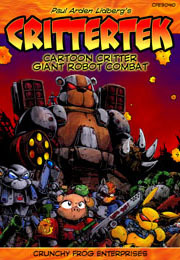 CRITTERTEK is Cartoon Critter Giant Robot Combat! Huge Robotic Critters battle it out for supremacy in a bizarre cartoon world! Includes complete rules for constructing the giant TEKS and several examples! Also includes a 6 page comic strip draw by Brian Burke! This game stands alone and also works in conjunction with CRITTER COMMANDOS (available here! ).